Seine-Saint-Denis (French pronunciation: ​[sɛn.sɛ̃.də.ni]) is a French depairtment locatit in the Île-de-France region. In local slang, it is kent as "quatre-vingt treize" (i.e. "ninety-three") or "neuf trois" (i.e. "nine three"), efter the offeecial admeenistrative nummer o the depairtment, 93. The indwallers is cried Séquano-Dionysiens. Seine-Saint-Denis is locatit tae the northeast o Paris. It haes a surface aurie o anerly 236 km², makkin it ane o the smawest depairtments in Fraunce. 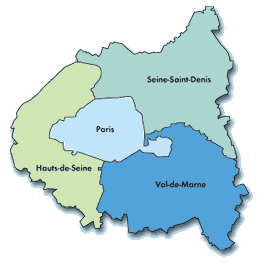 Seine-Saint-Denis an twa ither sma depairtments, Hauts-de-Seine an Val-de-Marne, form a ring aroond Paris, kent as the Petite Couronne ("little croun"). Thay fuirm, thegither wi Paris an fower ither depairtments, the region o Île-de-France. Seine-Saint-Denis wis creatut in Januar 1968, throu the implementation o a law passed in Julie 1964. It wis formit frae the pairt o the (hitherto lairger) Seine depairtment tae the north an north-east o the Paris ring road (an the line o the auld ceety waws), thegither wi a sma slice takken frae Seine-et-Oise. Seine-Saint-Denis haes a history as a veritable left-wing stranghauld, belangin the ceinture rouge (red belt) o Paris. The French Communist Pairty inspecially haes maintained a continued strang presence in the depairtment, an still controls the ceety cooncils in ceeties lik Saint-Denis, Bobigny, Le Blanc-Mesnil an La Courneuve. Till 2008, Seine-Saint-Denis an Val-de-Marne wis the anerlie depairtments whare the Communist Pairty haed a majority in the general cooncils but the 2008 cantonal elections saw the socialists acome the strangest group at the Seine-Saint-Denis general cooncil (while the Communist Pairty gained a majority in Allier). A commune o Seine-Saint-Denis, Clichy-sous-Bois, wis the scene o the daith o twa young fowk whilk spairkit the naitionwide riots o hairst 2005. In October - November, 9,000 caurs wur burned an 3,000 rioters wur arrestit. Seine-Saint-Denis is the French depairtment wi the heichest proportion o immigrants: 21.7% at the 1999 census (see table belaw). This figur disna include the childer o immigrants born on French soil as weel as some native elites frae umwhile French colonies an fowk wha came frae owerseas Fraunce. The ratio o ethnic minorities is difficult tae estimate accurately as French law prohibits the collection o ethnic data for census takkin purposes. Housomeivver estimates suggest thare 500,000 Muslims oot o a tot population o 1.4 million. Saint-Denis is hame tae the Union o French Islamic Organizations (UOIF) in the Bourget destrict, which annually hosts ane o Europe's major Muslim conferences, Paris-le-Bourget. In 2005, 56.7 % o young unner 18 wur o foreign oreegin includin 38% o African origin (22% frae Maghreb an 16% frae Sub-Saharan Africae). Islam is the main releegion. A nummer o hip hop artists come frae the Seine-Saint-Denis, includin ane o the first major hip-hop groups in France, NTM, as weel as Lord Kossity, or mair recent acts lik Tandem or Sefyu. Seine-Saint-Denis wis scheduled tae be the steid o a 2004 Internaitional Exhibition. Housomeivver this event wis cancelled. This page wis last eeditit on 10 Mairch 2018, at 22:59.